I have never been one to follow the recipe. I’m the kind of person who throws in a pinch of this, a splash of that, a squeeze here and a dollop there. If the recipe says one cup, I’ll probably put one and a half if I especially like the ingredient. It usually leaves me racking my brains after a particularly good experiment, trying to remember the quantities and steps I took to reach the final product. I’ve lost track of how many times my husband has said, “Please tell me you remember how you made this.” Kind of, sort of, maybe, ish…it’s never the answer he’s hoping for. This is why the process of fermentation had always made take off the apron. I mean, it’s alive, it’s growing, it’s a recipe that must be followed for it’s very survival. So when a friend gave me a kombucha starter or scoby, I accepted it with hesitation, knowing in the pit of my stomach that this little guy didn’t know what it had coming. I spent that evening researching kombucha, looking for the perfect (most straight forward) recipe I could find. I wanted to prove to myself that I could really make this work; that fermentation and I could be friends. No, no! Back to the recipe, my mind told me. Just in case, I confirmed that I did in fact have Lemon or Mint tea in my pantry. Good. Back to the recipe. I waited for the black tea to cool and added the slimy scoby to the jar with the brownish liquid. It begged the question; how on earth is this really good for me? In my research for the perfect recipe I had come to read that kombucha has a well-rounded list of health benefits. It's actually been around for more than 2000 years, starting in China. It's since been called, "The anti-aging juice" and "The fountain of youth elixir" because of it's claim to posses an abundance of antioxidants, help joints, boost the immune system, and improve GI health. In fact, Dr. Greenwalt from the Department of Food Sciences at Cornell University is quotes for saying, "Kombucha may be a healthful beverage in view of its anti-microbial activity against a range of pathogenic bacteria. This may promote immunity and general well being. It is recommended that Kombucha be consumed at 33 g/L total acid, 7 g/L acetic acid, to obtain these beneficial attributes." Then, it hit me. Four to 10 days? What did that really mean? To me, looking for an exact recipe this was a wide window of time. As a nurse, I’d never accept a doctors order that said, “Take medication for four to 10 days”. So I called for clarification, my friend that is. She said she prefers seven days, so I put it on my calendar and hoped for the best. On day seven, I strained the liquid from the scoby, reserved a cup of that batch to add to my next one and placed the scoby in this new little home while the new batch of tea brewed and cooled. It was time for the true test of my efforts. I poured myself a sample of my first batch of homemade kombucha. I took a small sip…only to take another in delight of the knowledge that it was actually good! It was sweet but not too sweet, a touch vinegary but not too vinegary. I added a squeeze of lemon juice and some crushed ginger (I had to make it my own at some point) and I was even more impressed. It was a success! I managed to keep my kombucha alive and for several months now and I have come to realize that it is fairly easy. 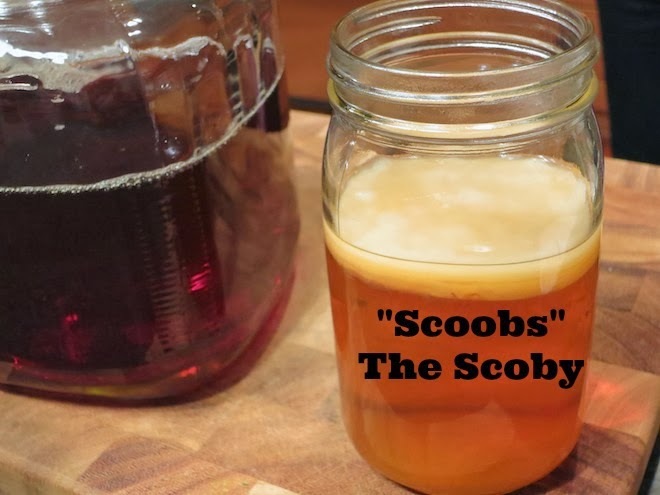 I have left my batches for five days to ten days, left the scoby in the fridge for periods when I didn’t have time to make a new batch, and separated the ever-growing scoby (who has now come to be known as “scoobs”) into new ones to give to others. I have come up with various flavors also of lemon, mint, blueberries, apple, and other odd combinations, most of which have been delightful. I have however stuck to the initial sugar and black tea recipe….for now. I can say that as an otherwise healthy individual, it makes me feel more alert in the mornings and it has helped me with personal concerns, like headaches and maintaining a healthy gut. What have you heard about Kombucha? Do you drink it? If so, why? Stone, T. (2013). Kombucha Tea. American Nutrition Association. 36(3). Retrieved from: http://americannutritionassociation.org/newsletter/kombucha-tea. Steinkraus, K., Shapiro, K., Hotchkiss, J., Mortlock, R, (1996). Examinations on Antibiotic Activity of Tea Fungus/Kombucha Beverage. Acta Biotechnologica. 16(3), 199-205. I've never tried it yet my friend just took a fermentation class. They made one recipe (not kombucha, something else I can't remember how to spell it, LOL). In their next class she is super excited that they will be making kombucha. Since you said it tastes good, makes you feel alert and shared the recipe- maybe I'll try it! Thanks for the information and post full of resources. I like to try new things!